Happy Friday! A week from today is Good Friday, which means you have exactly one week to get all the elements to create the perfect Easter basket. I don’t know about you, but I always love getting a bunch of little gifts no matter the holiday. Some practical, some funny, some delicious. My grandmother had a special talent for finding those little items that always came together and were so much fun to open. 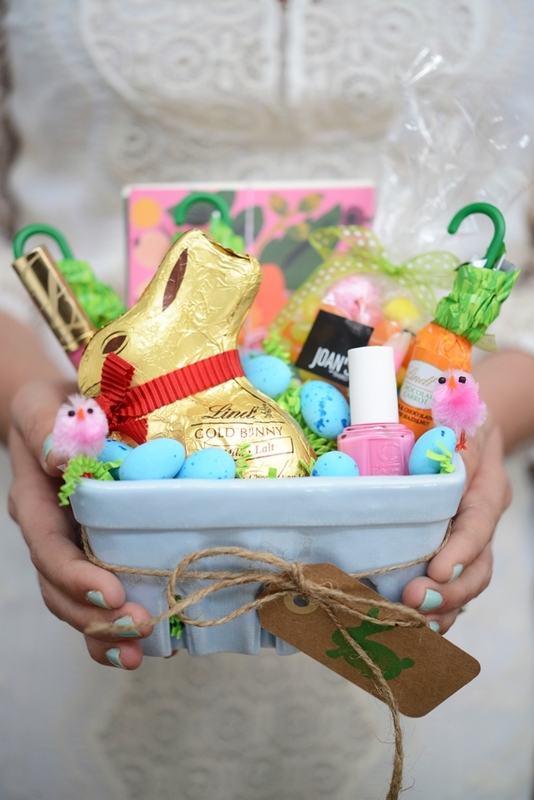 Inspired by her, I thought I would share my picks for an Easter basket that is sure to please those nearest and dearest to you. First and foremost, you need a basket. I think this lunch box from the ever so talented Lulie Wallace will do the trick. And will certainly serve as a reminder to bring your lunch to the office and save a few extra bucks for your next getaway. I am sure it comes as no surprise, but I have a sweet tooth. I’ve had to curb my addiction just a bit as I recently had my first cavity filled but I will allow myself to indulge for these holidays. My sweet picks include these candy bars from one of my new favorite sites Provisions, these sour gummy eggs and my all-time favorite mint candies that always remind me of my Nana. I love introducing friends to new products or lines that I adore. A few that I know would be well received and fit the occasion perfectly include: a market pad from my all-time favorite stationary company, an egg-shaped soap from the one and only Fresh, my new favorite spring scent, and a travel book for one of my favorite cities. I hope you have a lovely weekend and I look forward to seeing you back here next week!